Responsible people and organizations always have a plan B. This approach is instilled in us from an early age. You may want to go to Hollywood but just in case, have a backup plan and get that history degree. 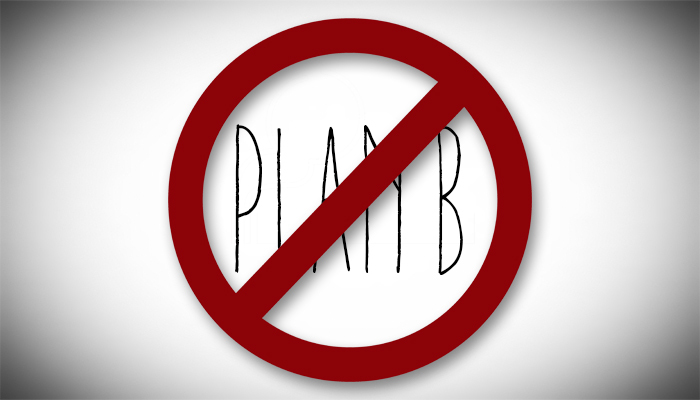 While there are clear benefits to the safety net of a plan B, there is a significant downside. The safety net may end up being a noose. From a psychological standpoint, if you know you have a backup plan then you cannot be 100% committed to plan A. Not having a plan B is an approach that many successful individuals have intuitively understood is a key to winning. Elite athletes are well known for putting all of ‘their eggs in one basket’. Recent research from Wharton has confirmed the downside to making a backup plan. The process of considering a backup plan may result in less effort being invested in the primary goal, inevitably reducing the chances of success. Professors Shin and Milkman, detail their findings in “How Backup Plans Can Harm Goal Pursuit: The Unexpected Downside of Being Prepared for Failure”. To be or Not to Be Responsible? So do we play it safe but lessen our chances of winning? To some extent this depends on your ability to tolerate risk and the consequences of losing, in addition to the importance of your goals. Milkman and Shin suggest delaying making a backup plan until after you have done everything you can to achieve your primary goal, however, the reality is that sometimes this will be too late.